St. Mary’s is taking on a whole school approach to behaviour management by adopting Positive Behaviour for Learning (PBL). 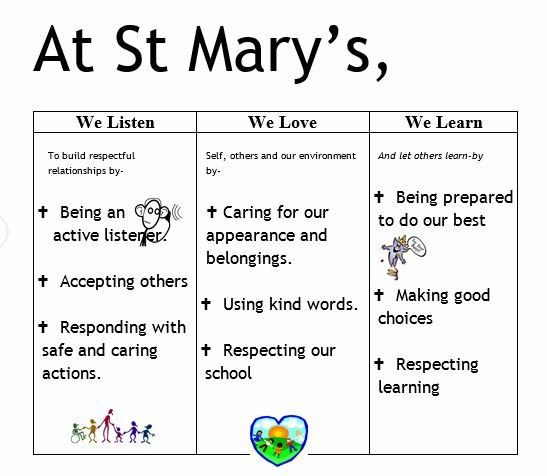 St Mary’s has taken on a PBL as a whole school approach to communicating behavioral expectations and consequences. These are a broad range of systematic, tailored and proactive strategies for achieving social and academic learning outcomes whilst minimising problematic behavior. PBLs help our students to take responsibility and control or their actions by defining, teaching and supporting positive student behaviour. It allows our students to discover their unique potential. The matrix below was developed by our community, based on the three rules of our school LISTEN, LOVE, LEARN and anchored in the examples of Jesus.